MoonMarble.com - Aaron West - "Orange, Green, and Silvery Dichroic Vortex with Opal"
Art Glass → Contemporary Handmade Marbles → Aaron West - "Orange, Green, and Silvery Dichroic Vortex with Opal"
This is a handmade marble by Wichita artist, Aaron West. 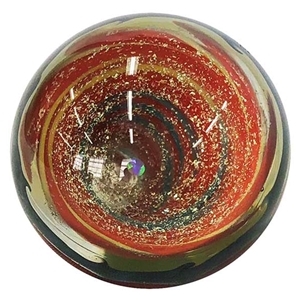 It features loads of silvery dichroic glass and orange canes spiraling down into the marble with a round opal in the center. Back is decorated with a raked green, white, and orange design. Due to the magnification of the sphere, the spiraling design appears to be going deeper into the marble than physically possible. Truly a magnificent trick of the eye. Approximately 2" in diameter. Signed and dated by the artist.